Books like this make my cerebellum tingle in delight. (Well, technically I guess that would be the Temporal Lobe of my Cerebral Cortex, but that doesn’t sound as catchy; nor am I a brain-specializing scientist—but I digress). All that to say this: this is a well-written book that makes science interesting and makes the reader feel smarter after reading it. If you enjoy books like Malcom Gladwell’s OUTLIERS, then you are going to love this, too. Charles Duhigg, an investigative reporter for THE NEW YORK TIMES, has a knack at making the ordinary seem interesting. Yes, reading about how Claude Hopkins got America brushing their teeth via his Pepsodent campaign was captivating. Yes, I was on the edge of my proverbial seat while reading about the foaming effects of shampoo. Oh, and that safety campaign for the aluminum company Alcoa? Enthralling. 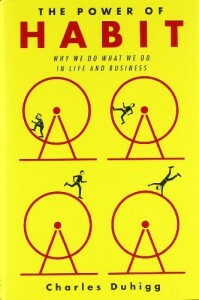 The main substance of Duhigg’s book comes from the first two sections of his book: the habits of individuals and the habits of organizations. In the third section, reading about Rosa Parks and the Civil Rights Movement and about the growth of Saddleback Church was interesting, but it didn’t have the same learning hook of knowledge that the first two sections introduced. The author uses three parts of habit: cue, routine, and reward. To see how this worked with each situation drove the book home. I would be interested to see a comparison study done between the motivational influences found by Deci (as presented in Daniel Pink’s book DRIVE—also a fantastic book) and those rewards that create habits. In other words, one study shows how the carrot doesn’t always work, but the other shows how the right carrot always work. They probably couple together (many of our habits have intrinsic reward), but a continuation of this study would be worthwhile. Overall, this is an excellent book that will stimulate thought and is easy to read. The author is not a scientist, so his lessons are not empirical, but he does have an inviting style that takes others’ findings, making them interesting and worthwhile. I’ll be looking forward to reading more by Charles Duhigg.